The key settled at the bottom of the Seine. Amongst so many others, that were already rusting away. At the same time the young lovers on the bridge were locked in a deep kiss. Each one still holding an open hand over the railing. They had decided to lock in their love and throw away the key. Silently they had exchanged vows on this late summer evening, to love one another forever. Little did they know how strong the power of locking away their love would be, what the impact would be on their fragile souls. But they were about to find out. I feel a bit rusty, just like the keys, I hope you enjoyed my short piece of flash fiction of 103 words. 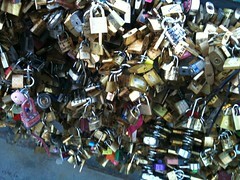 I took the photograph of the love locks on the Pont de l’Archevêché. I am not sure if they are still up, as on the Pont des Arts, they have been removed.